Experience a year full of art enjoyment and horse enthusiasm at the same time. Every year Kerstin Tschech puts together a combination of 13 individually painted horse motifs, which show unique moments from the world of horses. 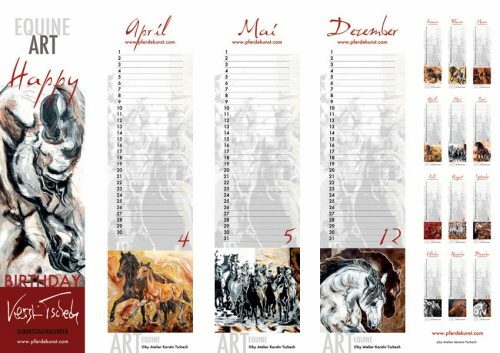 In this horse calendar you will find wild herds of horses in free nature, expressive horse portraits or abstract horse representations that will accompany you throughout the year. The Horse Calendar is also the perfect gift for every horse lover. 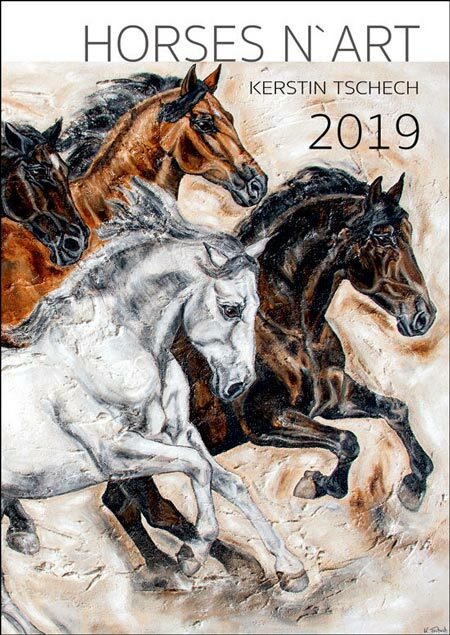 To keep an eye on all birthdays, the year-independent horse birthday calendar guides you through the year with a mixture of atmospheric horse paintings. The horse paintings are specially selected by the artist for this purpose and show her attachment to the horses and give an insight into her handwriting. The 13 artistic implementations also show horse motifs full of dynamism, strength and enjoyment of life. Thus this decorative birthday calendar appeals to horse lovers of all ages and at the same time with its perpetual calendar a great gift idea for horse lovers.